How to get there This a great climb in the Seeschlund valley. 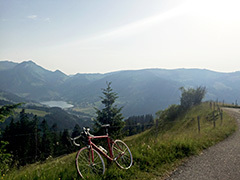 The climb starts nice and easy on the road to Schwarzsee at Friesmatta (888m). Take the turn-off to the left just before reaching to top of the main road to Mösli (a nice restaurant on the Ättenberg road). The road up to Ättenberg is often quite steep, but nothing really extreme and all below 20% for sure. The views improves as you get higher up and just before high point of the road at Schön Ättenberg (suitably named) you have a nice view over the Schwarzsee – likely the best you get in the area on an asphalt road at least. The high point of the road (1506m) is 200m before reaching the actual pass (1492m). Other comments Around Schön Ättenberg I had a few metres of gravel, but this might be temporary. From the pass the road goes down steeply (to 1468m) along the pass opening in the ridge and then it climbs again to Hohberg (1485m), from where a gravel road (just about possible to handle on a road bike (not recommended)) down to the asphalt road from Steiners Hohberg (the owners of the house there looked very doubtful seeing a road cyclist coming down there, but the asphalt road from there is great down the valley). Also see the climb up the opposite side of the Seeschlund valley to Hapfere(n) Schwyberg (Schwyberg) (1528m) which is a great climb too! And also see the Col de la Salzmatt/Salzmattpass (1638m).